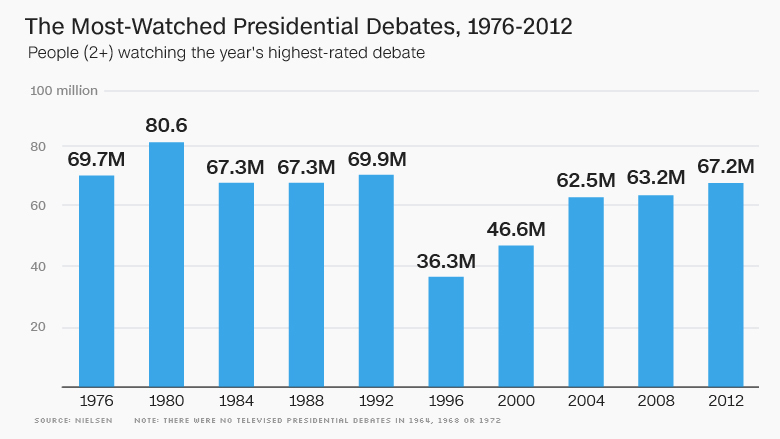 The first presidential debate of 2012 averaged 67 million viewers. Experts believe the first debate this year will beat that number. Exactly how high? A debate topping the 100 million viewer mark is unlikely — but not inconceivable. Television networks stand to make millions of dollars from the ads that run before and after the debate. The ratings matter for political reasons as well: Any surprising victory or embarrassing performance by a candidate will be magnified by the sky-high audience size. 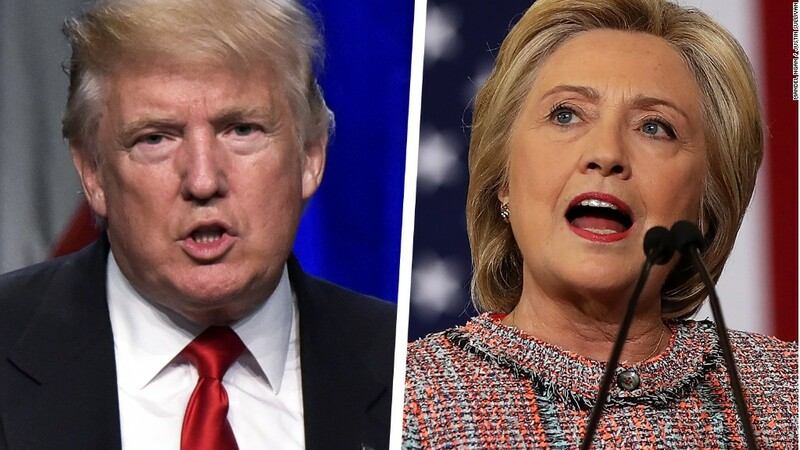 That's why a guessing game about the ratings is running parallel to the speculation about what Hillary Clinton and Donald Trump will say on Monday night. Television executives and campaign aides privately think that the total viewer number released by Nielsen will land somewhere between 80 and 100 million viewers. The most-viewed debate in American history, according to Nielsen, was the sole Ronald Reagan-Jimmy Carter debate in 1980. Almost 81 million viewers tuned in. Back then, debates were only carried by the three major broadcasters — ABC, NBC, and CBS. This year the debates will be on more than a dozen TV channels. The face-offs will also be live streamed all across the web in ways that weren't technically feasible just four years ago. Facebook and Twitter will carry the debates live right within their social networks. Traditional television remains dominant, however. During this election season's primary debates, more than 95% of the overall viewership happened via TV, with the remainder via streaming. Nielsen's figures count viewers who watch at home with TV sets. Offices, bars, hotels and other out-of-home locations are not fully measured. That's why the Super Bowl is always under-counted. This year Nielsen said 112 million Americans watched the big game, but the total audience was undoubtedly larger. Monday's Super Bowl of Politics will be similar. Some groups are already planning viewing parties. Football is the debate's only serious competition for viewers on Monday night. ESPN is expecting that its "Monday Night Football" ratings will be below average due to the debate. Then again, some Americans are fatigued by the seemingly endless election and may seek out alternatives to the Clinton-Trump match-up. According to the U.S. Census Bureau, there are about 240 million adults living in the country. Roughly 225 million are eligible to vote this year, according to the Pew Research Center. Each debate is normally watched live by just a fraction of the eligible voting population. But other Americans catch up later by watching news highlights and reading about the results, which is why the post-debate coverage is so important. The first Obama-McCain debate in 2008 had 52.4 million watching live. That turned out to be the lowest-rated of their three debates. But in 2012, the first Obama-Romney debate, with 67.2 million viewers, was the highest-rated of their three debates. The first debate was also the highest rated in 2000 and 2004. Nielsen will release TV ratings for Monday's match-up on Tuesday. Various streaming services may also release viewership data, but it won't be comparable to Nielsen's TV ratings for a variety of reasons. Bottom line: Americans have more ways to watch than ever before. Some of the methods won't be measured well. But industry veterans believe the TV ratings alone will top the past debates. Their reasons include the historic nature of both Clinton and Trump's candidacies; the viciousness of the campaign season; and the ratings records that were set during some of the primary debates. TV executives and political types have been debating the ratings possibilities in emails, calls and cocktail party conversations. As one top Hollywood executive put it: "This is the ultimate reality show." And Trump has a reputation as a ratings magnet -- something the candidate and his campaign aides are fond of pointing out. Then again, the ratings for the summer conventions, while respectable, were not through the roof. And prospective voters know they have two more chances to see the candidates together: At the follow-up debates on October 9 and October 19.